When you first take your puppy home, he is so cute and fluffy that the last thing you probably want to think about is training. However, Siberian Husky puppy training should begin the minute you bring your puppy home. Starting young is important with Siberian Huskies as it will make training that much easier when they get older. You need to teach your Siberian Husky that you are the leader and to respect you as one, and there is no better time to begin that training than when he’s still a puppy. Fortunately, if you break down Siberian Husky puppy training into a few steps, it doesn’t have to be difficult or headache-inducing and can even be fun. As with any other puppy, the first thing you’ll want to begin doing is potty training. Young puppies typically eliminate every 45 minutes to 1 hour. Make it a habit of taking your puppy outside to go potty every hour, as well as after he eats, drinks, plays or wakes up. When taking your puppy outside after he’s eaten or drank, be sure to give him sufficient time to eliminate. He may or may not go right away. If he doesn’t go right away, what you want to avoid doing is to take him back inside too soon. He may then eliminate inside and learn to go potty indoors instead. Pick a designated area in your yard for your puppy to eliminate. With enough repetition, he’ll soon learn to go in that spot and to go outside for potty. Socialization is a crucial component in Siberian Husky puppy training. Dogs that have not been properly socialized as puppies can be potentially dangerous to other people or dogs when they get older. Socializing is best done at 12 weeks of age. Start by inviting lots of people over to your house and also take your puppy to places where he can meet lots of new people. Everyone he meets should pet or stroke him and even feed him treats. The main goal is that you want meeting other people to be a positive experience. If your puppy hasn’t had all of his vaccinations, you should avoid going to places where many dogs pass through such as dog parks or pet stores. Also introduce your puppy to other dogs and animals, but make sure they are healthy and well socialized themselves. Once your puppy has had all of his vaccinations, you can begin taking him to parks or areas where there are many opportunities to meet other people or other dogs. 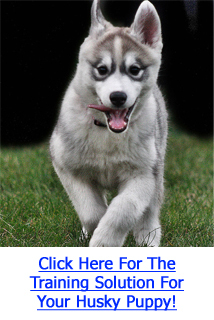 Click Here To Discover More About Siberian Husky Puppy Training! All puppies will instinctively nip or bite. The best way to correct this type of behaviour is to do what his littermates or mother would do. While playing with your puppy, in the event that he bites or nips you, let out a loud yelp and stop playing immediately, even leaving the room if necessary. This is similar to his littermates ending play if he’s being too rough to them. After some repetitions, your puppy will learn that biting or nipping ends playtime which is bad and will avoid doing it. Puppies love to chew either because they are teething or because they are bored. In order to handle this behaviour, you need a good variety of chewing toys at hand. However you should avoid using items like old slippers, socks or shirts as toys because your puppy won’t be able to differentiate old unwanted clothing from new! Focus on diverting the chewing towards his chew toys. If you catch your puppy in the act of chewing on something that isn’t his, replace it with one of his chew toys and praise him when he chews on the toy instead. Your goal is to reinforce the chewing of items that are acceptable for him to chew on so that he will want to chew them. Most importantly, have lots of patience and consistency when training your puppy and you will be on your way to having a well socialized, obedient and balanced dog. Siberian Husky puppy training will ensure that your puppy grows into a well behaved canine citizen that is a pleasure to be around.